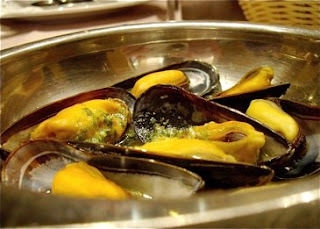 Place Saint Catherine in Brussels used to be the place to enjoy seafood in the Belgian capital. 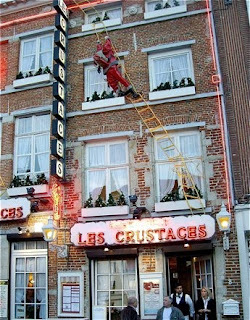 When looking for a place for lunch, we passed a couple of seafood restaurants before choosing Les Crustacés. It was a decent experience, but after three meals here earlier I find that the food is not what it used to be. I am afraid that the square is slowly turning into a tourist trap. Les Crustacés occupies two floors in an old Flemish style, red brick building located on Place Saint-Cathérine, a beautiful square. To get there take subway 1a/1b to the Place Saint Cathérine, or walk down - it only takes 10 minutes from Grand Place. Place Saint-Cathérine is located in one of the most original areas of old Brussels with many old houses and much of the original character that is rapidly disappearing elsewhere. In summer you may sit outside and enjoy your meal with a view to Église Saint Cathérine. We visited late fall and had to sit inside. Mixed service. Professional, but rather impersonal staff. We were led to a table immediately. We ordered wine before we chose our fixed lunch menu. We did, however, have to wait a little too long to be served the first out of our three course lunch. 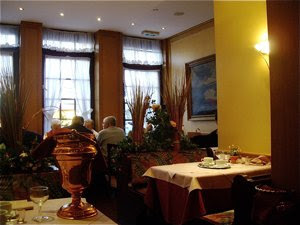 We were seated in the ground floor room at Les Crustacés. A pleasant traditional interior in yellow and cream colours. Oak coloured wooden details, chairs and tables. Nicely set tables with napkins, glass, china and cutlery. I found too many tables and chairs, in the room and it felt too overcrowded. I chose three courses from the lunch menu priced at €23 This is what I was served. I chose seafood as an entree and main course. I chose mussels, a Brussels speciality, but here baked with garlic and parsley butter, not Moules Frites, steamed and with fries, as is the rule in Belgium. The mussels were served sizzling hot, directly from the oven, presented in a steel bowl. Fresh and well prepared, not overcooked, but tender and moist. Delicious garlic and parsley butter. I love seawolf, and served with lobster sauce, it was irresistible. I was, however, slightly disappointed. 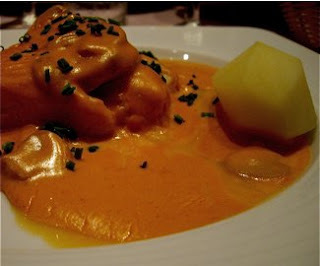 The fish was not served properly heated, and the sauce had started to cool down and thicken. The fillet was a little under cooked, but I do prefer that, too over cooked fish. One, nice, waxy potato. The sauce, that provided most of the flavour, did not tickle my pallet. It was a little bland, with not enough salinity, too much sweetness and low in acidity. This was the contrast to the lobster bisque served earlier at another restaurant in the area, that was too salty and over powering. 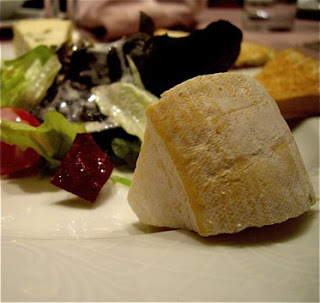 I was served three cheeses, one firm cheese, one Brie / Camembert variety and a blue cheese, accompanied by leaf salad and vinaigrette. I prefer cheese served with jam and other stronger contrasting tastes, than provided by the slightly bitter dressing. Medium matured cheese, sadly served too cold. With this in mind, I would recommend a dessert, rather than this classic end to the meal. We decided to order the white wine of the house, as we all ordered a fish menu. We served a bottle full bodied, medium dry white wine, at a decent price. Wine of the house is arecommended choice, if choosing a full seafood menu. A reasonably priced seafood lunch. Quality a little uneven. Hot food partly served cooled, cheese served cold. Delicious entree, but main course low in flavour, but well prepared.